Making Kodi autoplay a playlist when loaded, then repeat that playlist until stopped is not as straight forward as you might think, with some trial and error reading the issues various people encountered, this is how i ended up successfully making Kodi play and repeat my video play list when started / loaded up. That’s the obvious part done, however if you do that and leave Kodi to it, you will find when you reach the end of the play list Kodi will not repeat it. 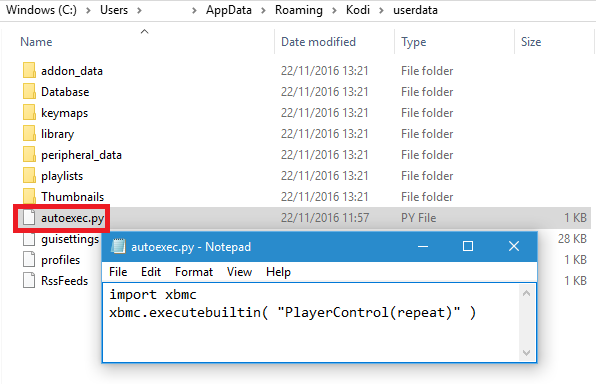 Once you are in the Kodi userdata folder you want to create a file called autoexec.py, you can do this in any text editor. For example Notepad on Windows or Nano on Linux based operating systems. If for some reason you are having trouble here is a zipped copy of my autoexec.py you can simply unzip to your Kodi userdata folder. The end result should be when Kodi boots your playlist will start playing and the autoexec.py script will ensure the play list repeats in-defiantly. I have done the above on a Raspberry Pi 3 running Kodi via OpenELEC 6.0.3 with no issue, my videos happily repeat all day long in our showroom. However i found if the TV was not on when Kodi was loaded it would only play the first item on the playlist, then keep repeating the first item on the playlist only. This for me was not ideal as i needed everything to just work with no user interaction, which is what the solution detailed in this blog post allows for. I hope this is of help to someone anyway! That’s really going to depend on the OS you are running Kodi on, if its Open ELEC or Linux you should have SSH access by default, so can just connect via SFTP and download the playlist, modify it in Notepad for example, then re-upload the playlist and any new media to the location you specified on the playlist. After doing so you could reboot and Kodi should startup and be playing the new playlist. But maybe you know how to do playing only 30 second for every item on playlist ? I can’t think how you would do that in Kodi. You might well need to write a custom plugin to do something like that. You might have more luck asking on the Kodi forums, how come you only want to play 30 seconds out of curiosity? I set up my osmc for with the partymode(music) command. Works very well in cooperation with updating the library on startup. As I added the ‘music’folder of my USB flash to the library, I just need to copy the desired files to the flash drive and plug it to the pi, actually installed in my car. However I navigate around the file system I cannot find the playlist .m3u file. I have created the playlist, then saved it, but got no option nor indication of where it was going to be saved. Am I meant to create the playlist then save it to the usb drive containing the media file on my windows pc? I feel like I am missing something very obvious here. Any help is much appreciated, thanks. Do you see it in your userdata/playlists folder? The location of the userdata folder will vary depending on your OS, however i included where to find them on various OS’s in the above blog. Great job Matt Hill !!! Now i’m working to get a simply way to replace remotely the MP4 file of the playlist. I would like to offer it to my customers to do it themselve. Do you know any “simply” tool to do it in the way of a DropBox or similar? Samba maybe? THANKS AGAIN ! I am very new to this. I appreciate any advice you can give. As TW mentioned in the comment below use OpenElec and everything should work as described. I have a couple of Pi 3’s in our showroom running Kodi via OpenElec, playing video all day long. Slightly off topic, however MP4 Museum is a really simple solution too: http://mp4museum.org/ providing you only want to play MP4 video. Now for my next challenge. Playing 2 different videos on 2 different raspberry pi’s in sync. Wish me luck. Matt, cheers for the info. Do you know if it’s possible to run a multi-media playlist at start-up AND when the screen-saver kicks in? So when no-one is using the presentation screen it defaults to the playlist. I’ve looked at various Kodi add-ons but none seem to be suitable. Thank you for the tip Michel, I will try that next week and see! Edit – I tried this and you were correct, sometimes, however not always this seemed to be an issue. Making that little changed seemed to stop it from happening anyway, thanks for letting me know! Do u hav solution to autoplay videos from usb drives(pendrive) when plugged in? I’ve followed your guide (thank you for sharing) but I’m using the party mode add on as the “enable playlist at startup” option had now been moved out of the skin settings in Kodi. The file in the playlist will play on startup but will not repeat whichever set of code I use from your guide in the autoexec.py file. Any help will be much appreciated, I’m using a 1st Gen Fire Stick if that helps. Thanks for the post, looks like this didn’t do what I needed but It did give me the idea of using an API. I simply wanted this for running a rstp stream, so this worked perfect, I’m running mine every 5 minutes with a cronjob just to make sure it’s always up (since it’s a live feed), I’m sure there’s other ways as well. Seems the option “enable playlist at startup” is not available anymore. Time to update this article ? Does that work for you on later versions? and how to create playlists ? I followed your guide with Kodi version 17.6 and skin confluence. There is no entry in the Skin Settings General, Windows startup. I created the autoexec.py file and placed it in the /storage/.kodi/userdata/ folder, because I use LibreELEC / OpenELEC. I did more than one reboot and did what I wrote in the file I shot before.